Smirk meets Maunsie at Lerwick Tourist Office. A Shetland cartoonist came face to face with his own creation following a visit to Lerwick Tourist Office. Stephen Gordon, known as Smirk, designed the character Maunsie da Market Cross as part of a competition held by Living Lerwick last year. 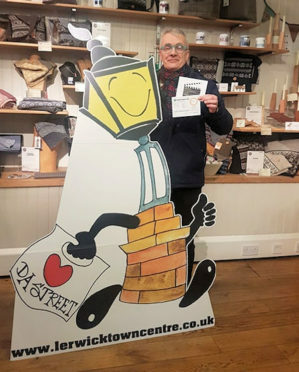 Entrants were encouraged to design a town centre mascot which would ultimately become the iconic character for the local area. Mr Gordon’s creation fought off tough competition to be crowed the winner as the directors felt his design of the Market Cross was a recognisable symbol for the town centre. He was presented with vouchers worth £100 for The Camera Centre and R W Baynes after choosing these shops to spend his prize in. Maunsie will be used for the next year as part of promotional campaigns focusing on shopping local and the benefits this brings to the local economy.